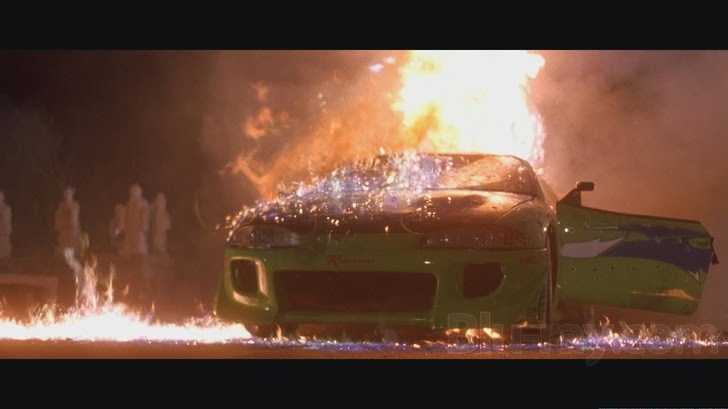 The journey through all The Fast and the Furious movies continued with 2 Fast 2 Furious, and I'm baffled that they kept the franchise going after this. Although, at this point in the franchise, it's not fair to judge, because there are no actual actors in the film. Tyrese? Come on, now. I forget that this movie was before the Transformers films decided not to give him any lines. Really the only saving grace for the acting in this one is - and it's really surprising to say - is Paul Walker. He's the only one where I believe he's actually who he's playing to be. Everyone else must of been given the direction try really, really, really hard - and overdo everything. 1) In the DVD Netflix sent me, the preview film was Timecop 2: The Berlin Decision starring the immortal(?) Jason Scott Lee. So my expectations were already riding high. 2. Suki. So, this girl had to be one of the executive producer's daughter, right? All of the plot holes in this film notwithstanding, could she have been the most ridiculous part of this story? An all-girl street racing team, in a pink convertible? I need to retire all the question marks for this paragraph, but how this got past editing, or past the first day of filming even - somebody had naked pics of somebody for this to make it to the final cut. Or, nobody cared (much more likely). 3. The FBI guy is back! And this time, he's not a jerk? Not really sure why he's such a Brian fan. 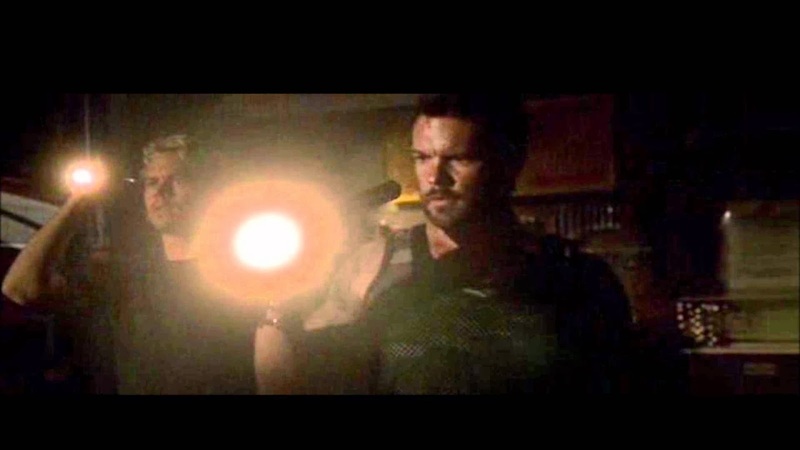 After all, Brian let Dom walk in the first film, letting the Fed's criminal get away. Now? After a year on the run, FBI guy not only loves Brian and wants to bring him back into the fold, but he's got a good attitude about it. I'm not sure this bodes well for the continuity of the franchise, and that's noted going forward. 4. More attempted murder is just cast aside. In the first film it was Tran shooting up and blowing up Brian's car. In this film, it's Ludacris' crew plowing Dodge Rams into police cars. An already ridiculous premise - why didn't the cops just start opening fire - what blows it over the top was that after Luda and Suki get picked up by the police, they're still radioing Brian. My guess is that, even in Miami, if you organize large trucks into smashing into standing police officers, they don't just let you sit on a park bench and call your buds on your push-to-talk. 5. More Suki. In the entirety of the scene, it is ridiculous. But on its own - this is legendary. If you've seen the movie, you know what's coming. 6. The tag team street race. Remember? This is how they got the two other cars. Brian and Rome had given the el guapos a quarter mile lead. No way they could of caught up. My thoughts on this were that either the logistics team either greatly miscalculated just how far a car could come from behind another - or just that there was no logistical team. Can't decide if I want more Suki or not. Tokyo Drift is next. Aside from the general sadness of anyone's death before-their-time, I just found the level of attention and loud support for Walker, and more so, the film franchise to be disproportionate. The headlines on CNN - CNN! - What will happen to Fast and the Furious? Can it continue? It was striking to me that this was what news organizations decided to dedicate full show segments to. Not the entertainment section, or quick hit headlines - entire segments, sometimes extending to multiple segments, multiple guests to commentate. And - for like a week or so this went on. All of it is kind of weird, I thought. Here's this hokey film franchise, the modern-day equivalent of a kung fu series, and people are lining the streets while Anderson Cooper discusses whether or not the franchise can go on without Walker. But then again, it also hit me - I had never seen the movies. Not one. Somehow, I was never encouraged or engaged enough to actually go to a movie theater to watch Vin Diesel in a lead role about fast-CGI street racing. Just wasn't going to throw down the $12 for that. Now, I'm sure I had sneaked across a few minutes of one movie or the other while skipping by TBS or TNT on a Saturday, but I had never coherently pieced all 90 minutes or so of movie magic together. So, I decided to turn to Netflix and load up that queue. Yep, here it is. Entertainment. But once those were out of the way - it was time to delve in. 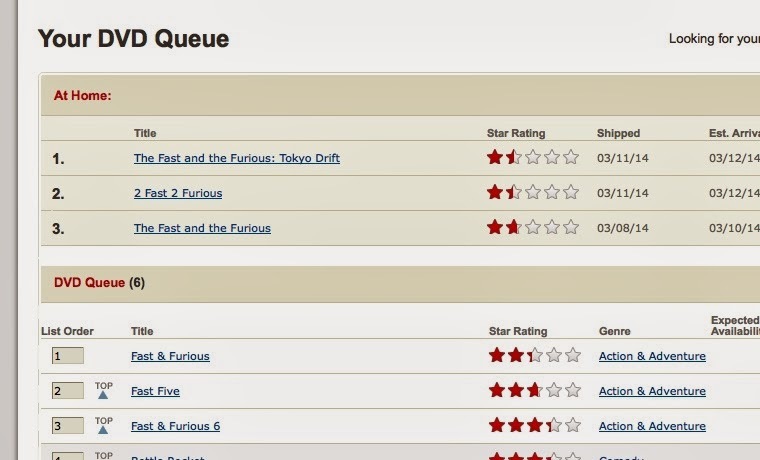 Last night, I watched The Fast and the Furious. 1) This movie came out in 2001. They were using floppy disks! Holy crap - now, I do not remember the exact timeline of when I stopped using floppy disks personally, and maybe this is historically correct for the time period. But, wow - floppy disks! And that Jesse kid is developing Rahal-level technologies for racing dominance on a garage computer with 1.8 MB. Incredible. 2) Obviously the movie is ridiculous, and from what I understand, later in the franchise they kind of give a wink to the camera that 'yeah, all of this is pretty ridiculous,' but I'm not sure they were at this level of self-awareness with this film. Too many people seemed to be trying too hard. It's going to be fun to see how this evolves over the series. 3) What was up with the FBI guy? What was he so mad about? Poor Brian (Paul Walker) is just doing his job - what he's been asked to do - and the Fed is all "hurry the hell up" on him. Guessing that when he was handed the script, they told him, "just do what every other Federal officer does in every other movie - be impatient and cause the protagonist some headaches." You see all these TVs? Oh wait, here's the receipt. 4) Something that as far as I know does not get enough eyebrows raised - the DVD players and electronics in Tran's garage. This was explained away and discarded waaaaay too easily. The Fed guy walks down the hall and says "it was all purchased legally," and everyone just moves on. This is ridiculous - what the hell did Tran need with 15 DVD players and 20 entertainment systems? All in boxes? Stacked in his garage? Nope, they all just let it roll - I'm guessing they figured Tran wanted a DVD player with all 20 TVs in his house, because in 2001, big flat screens only cost about $6,000 each. Did this get explained and I just missed it? That's definitely possible, as I'm happy to admit that the dialogue did not require me to hang on every single word. But just discarding it with "he bought it all legally" with "Oh, he did? Oh, okay then." That's a bit much. in the real world. In tF&tF, it's Saturday night. 5) So Tran wasn't the bad guy? Cop Paul Walker didn't decide to at least drop to the Feds that Tran and his boys are zipping around on crotch rockets with automatic weapons, shooting up cars? "They blew up my green car, man - that's attempted murder!" They can't do anything with Tran once he's in custody? At no point during interrogation, the Feds didn't say, "Look, Johnny - we've got you and your buddies stone solid for attempted murder. You play a little ball with us on who's jacking these trucks, and maybe we can plea that down a tad." Pretty sloppy police work here. 6) And Dom and crew were the bad guys? Well, that's totally unredeeming. They were jacking trucks at the end to help Jesse - but why were they doing it before? Jesse was fine then. If we were supposed to feel empathy with Dom's team - what was the reason to? Jesse might have died anyway - so did anybody win in this? I'm hopeful more is explained on this in the sequels. 7) And finally - ten seconds in the Fast and the Furious World is a lot longer than the ten seconds in my world. I usually drive about 80 miles/hour, so a quarter mile for me goes by in about 12 or 13 seconds. These guys race a quarter mile at 140, and it goes on for two minutes. I know some of it is in slow-motion, but there's a whole lot of checking equipment, popping nos, checking mirros, and exchanging looks going on over that quarter mile. Just don't see how they get it all in. And that's what I learned. 2 Fast 2 Furious and Tokyo Drift arrived today, looking to knock those out next.